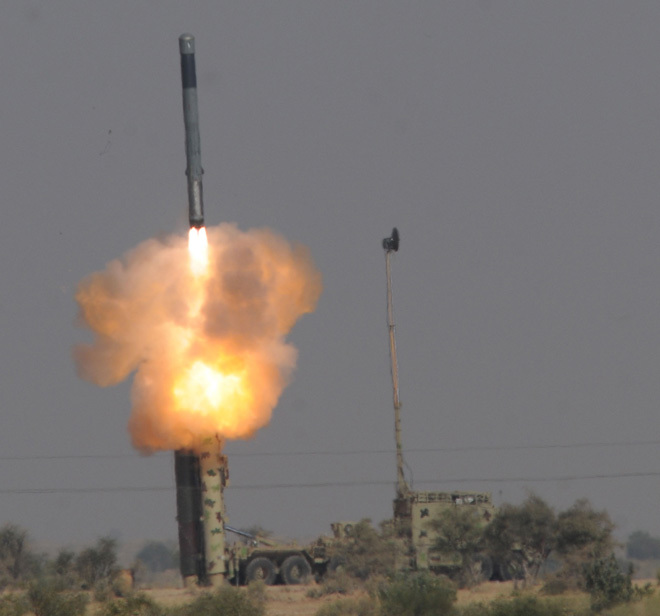 POKHRAN, RAJASTHAN (PTI): Indian Army on Saturday successfully test-fired the nearly 300-km range BRAHMOS supersonic land attack cruise missile here. "At 1000 hrs on Saturday, the Indian Army fired BRAHMOS land-attack cruise missile successfully against a designated target at Pokhran test range in Rajasthan, demonstrating the weapon's supreme operational capability," defence officials said. "BRAHMOS missile system, the most lethal and potent weapon system for precision strike available with Indian Army, has proved again its effectiveness in today's successful launch," said Sudhir Mishra, Chief of BrahMos Aerospace. Dr. S Christopher, Secretary Defence R&D and DG DRDO congratulated Indian Army and BrahMos Aerospace on the successful flight test. The Indian Army has already inducted three regiments of BRAHMOS in its arsenal. All are equipped with Block-III version of missile, which was tested on May 8 and 9 this year. The fire-and-forget missile has the capability to take on surface-based targets by flying a combined high-low trajectory, thus evading enemy air defence systems. Inclusion of the powerful weapon system in Indian Army has given it a distinct operational advantage to knock down any enemy target even in the most difficult and hidden terrains, the officials said. The missile, having a range of 290-km and a Mach 2.8 speed, is capable of being launched from land, sea, sub-sea and air against sea and land targets.